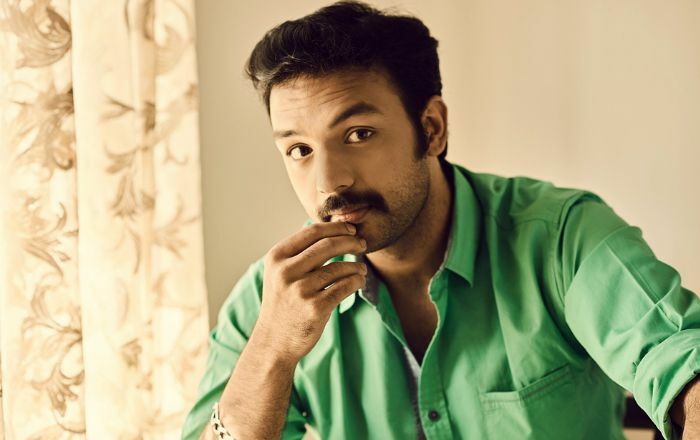 Amit Bhargav is an Indian actor known for his starring role as Lord Rama in Kannada television series Seethe and as Arjun Swaminathan in Tamil daily soap opera Kalyanam Mudhal Kadhal Varai. He has also starred in films like 2 States, Yennai Arindhaal, Miruthan and Kuttram 23. His is currently playing the title role as Vikram in Tamil romantic daily soap opera Nenjam Marappathillai. Amit Bhargav was born on 25 November 1989, in Bangalore, Karnataka, India. He’s currently 29 years old. Amit Bhargav married Sriranjani, an anchor works with Star Vijay, on June 16, 2016 in Chennai. They both first met at a Theatre workshop, where they exchanged numbers and developed liking for each other. The bonding between the two soon turned into love and entered into wedlock after the blessing of their parents. His body specs are not known. In 2014, he landed his first starring role in a Tamil science fiction-romantic thriller, Vizhi Moodi Yosithaal, for his role as main antagonist in the film. He then went on to act in films like 2 States, Yennamo Yedho, Yennai Arindhaal, Miruthan, Kuttram 23 and Garjanai. in 2010, he made his television debut portraying Lord Rama in the Kannada daily soap opera Seethe, which was aired on Udaya TV. He gained lots of fame and offers after starring in this serial. Amit has appeared in a handful of TV commercials including Amarprakash Builders, Nice kitchen and Hamam. Unfortunately, we do not have exact data about his net worth at this time, but he should have made it big from his acting career. He’s one of the most sought-after actor in television industry. Basically born to Kannadiga parents, he learned Tamil after moving to Chennai in the summer of 2012 when he was offered to play Lord Krishna in Tamil drama, Mahabharatham in 2013. He lent his voice for Bigg Boss in Bigg Boss Kannada 2. He also voiced for characters Abhimanyu Singh and Harish Uthaman in Tamil films Thalaivaa and Thani Oruvan. Ami has won Vijay Television Awards twice in 2015 and 2017 for his stellar performance in Kalyanam Mudhal Kaadal Varai along with his co-star Priya Bhavani Shankar. He is currently starring in a romantic soap opera, Nenjam Marappathillai, which is a remake of the Bengali language love triangle series Kusum Dola, alongside Nisha Krishnan and Saranya.